The word “Chica” (pronounced ke-ka) in the Italian language is used for referring to small objects such as a coffee bean. Needless to say, nowadays, my Chica seems more like a large baking potato than a small coffee bean. Once upon a time, roughly seven months ago, I went to buy what was to be my first pet rat from the local pet store. 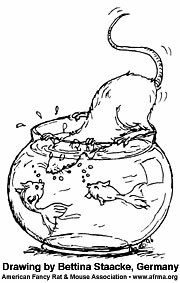 There were two small females in a large aquarium tank crowded with rats. One of the females was a pretty beige and the other was a dingy brown (really a pet store poor black) girl with a white belly, white legs and a white tip on her tail. The beige girl was sneezing and I knew enough, at that time, not to even consider buying a sneezing, wheezing rat no matter how cute she is. So, by default, the little brown girl with white legs came home with me and was named Chica. My heart just went out to this terrorized little brown rat condemned to be snake food and off to home we went. Meanwhile, back in the pet store, I had to finish shopping for a cage, food, and any rat book available with a shivering, little, frozen-in-terror Chica in hand. She urinated twice on me before I reached the check-out counter. My heart just went out to this terrorized little brown rat condemned to be snake food and off to home we went. At the house, that same night, I started to read the generic“pet rat” book I bought and came to the chapter on “choosing your new rat.” In the first paragraph, the book mentioned looking out for any signs of a respiratory infection like sneezing or discharge. Then it went on to say something about desirable “outgoing” personality traits like letting the rat “choose you” and NOT choosing the rat that was shivering, shaking, and terrified of human contact. The book also mentioned that the new rat would need a couple hours to adjust to her new surroundings so into the cage she went. Days later, she still wouldn’t come out of her box (an upright Kleenex container) in the presence of humans. When I would dump her out of her box onto my lap, Chica would begin to shiver uncontrollably. She occasionally let loose her bowel control and would often urinate. Chica almost went back to the pet store a few times during that first week, to say the least! I tried everything to coax her out of her “safety” box. Since dumping her out by force only terrified her further, I resorted to carrying her IN the box from room to room. I would sit on the sofa, watch television, or use the computer all the while holding a now “ratty” Chica-filled Kleenex box on my lap. I took that box everywhere in the house with me in the hope that she would feel comfortable enough to eventually stick her nose out, or better yet, come out and do all those fun rattie things that I was now reading about. All my hopes of play wrestling with her or taking her for a shoulder ride were dashed. To make a long story short, Chica never came out of her box unless the box was in her cage. So I resolved to make friends with her from within her cage walls. This called for procuring lots of enticing tidbits and a getting very cramped wrist (from reaching inside the cage to pet her). Two weeks after taking Chica home with me I noticed that her appetite had drastically increased. She went from eating seven Cheerios a day to eating handfuls. Then doom struck, one morning her stomach looked as if she had swallowed an egg sideways. 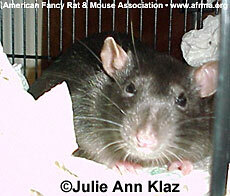 I phoned the vet in a panic with visions in my head of all those rats with tumors pictured in my rat book. Later that afternoon in the animal hospital, my vet began laughing and announced, “You’re going to be a Grandmother!” much to my astonishment and relief. We theorized that Chica was only 7 or 8 weeks old at that time. My vet then lambasted “those types” of pet stores for allowing “babies to have babies.”Sure enough ten days after the visit to the vet, seven pups arrived healthy and sound, six to be brown and one Spot who is Hooded. Having that litter was the best thing that could have ever happened for the not-so-little-anymore Chica. 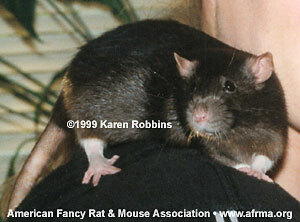 Her litter provided her with the rat companionship she needed to NOT become a neurotic, lonely rodent. The one rat book I had at the time didn’t stress the importance of the rat’s dire need for other rattie company. If Chica wouldn’t have been pregnant, she would have been alone and unhappy for a longer time in her life. Finally, Chica had other rats in her life to groom and lots of wiggling cushions to sleep on. After the birth of her babies, her personality changed overnight from timid and frightened to laid-back, calm, and outgoing. The funniest part of Chica’s pregnancy stemmed from me having read that rats instinctively know how to fish. “They drag their front feet in the water to locate the fish then they pounce with their teeth,” this I had to see...Chica ate feeder goldfish all during her pregnancy and nursing. It got to the point that she only had to smell fishy water on my fingers and she would hang off the top of her cage in anticipation. I must say that one of my friends was so disgusted by watching Chica devour a fish that I still hear about it to this day! Chica would catch the unwitting fish in her teeth by sticking her head up to the ears in water. This is from a rat that HATES water. She then would hold the still wiggling fish in her front paws and begin to slowly nibble starting with the nose and ending with the tail. Chica would sometimes first eat all the fins off the helpless goldfish before she devoured it. Her method of slowly nibbling away at the still moving fish’s nose, then eyes, and body is what completely nauseated my good friend. Chica always ate like a starved rat when it came to goldfish. Lately I don’t feed Chica goldfish anymore for fear of fishy parasites, but in her heyday she ate up to eight medium feeder fish at a time! All that extra protein and calcium really helped her overcome having been fed only “poor quality pet store food” during the first few months of her life. Since Chica was quite little when she became pregnant, I was concerned that her growth would be forever stunted. All visions of having a pet rat the size of a small lap dog were crushed. Poor Chica was doomed to be “a little Chica” for the rest of her life, or so I thought. However, this last November, Chica turned 6 months old and she began to GROW. Her head grew wider, her shoulders larger, her feet became broader, and even her eyes got bigger. I had read someplace that a healthy adult rat’s body shape should resemble a firmly stuffed sausage, not a pear or an apple. Well, I seem to own a plump, happy 460 gram Idaho potato who has developed into an incredibly amazing, loving rat. Chica now reigns as queen in an open rat condo on a rat table in the bedroom with five of her now adult female children and the Baby (a female Seal Point Siamese rat from Tarot Rats). It really is hard to believe that this large, beautiful, healthy, shiny, affectionate, begging-to-come-out-and-play, always-on-top-of-her-cage, two-hands-full of rat is the same shivering little brown girl that arrived home with me before the summer began. Thanks to Chica, I’ve been introduced to the joy of rats and am now owned by 13 of them!